Closing out our year-end coverage is individual top ten lists from a variety of The Film Stage contributors, leading up to a cumulative best-of rundown. Make sure to follow all of our coverage here and see Bill Graham’s favorite films of the year below. The year of 2013 was a time to look at films in a new way for me. While I enjoyed some experiences more, what I wanted to ponder most as I reflected on this year was what films stuck with me. I’m not one to rewatch films, so it has to make a lasting impression, especially considering the deluge of quality films that releases near the end of each year. When it comes to my list, you may not experience them the same way I did, but you’ll likely remember the time you spent with them just the same. They are wholly unique and sometimes absurdly audacious in their goals. For me, 2013 was a year of discovering the films in between the lines. The fact that Before Midnight, a film that rounds out what I see as the perfect trilogy, didn’t crack my top 10 is surprising to myself. But that’s how the chips fell for me. So, without further ado, let’s jump right in. If you showed me The Wind Rises without telling me it was a Hayao Miyazaki film, I might have thought we had a fresh new voice on the scene. Instead, this proves to be Miyazaki’s stated swan song and what a way to go (if he does, in fact, stay away from directing). In between the World Wars, The Wind Rises focuses on the tale of a young Japanese dreamer. He’s ambitious and aims to design the world’s greatest airplanes. But that dream, slowly, becomes warped by the fact that airplanes are newly mastered pieces of war. Chillingly observed, without much of Miyazaki’s notable flair of imagination, this is a quiet film that lets the story truly engage you and dares you to call it just a kid’s film. Running a minute shy of three hours, with Blue Is The Warmest Color, we are given a glimpse into young love unlike few films I’ve come across. The purity of desire, of connection, and how that can become hazy as life inevitably complicates matters. While a simple story on the surface, Blue proves that there are nuances to be explored when it comes to love. When the two leads have their first big fight, the messiness and rawness of the scene is so powerful that it threatened to bring tears to my eyes. This is a film that changes and grows up within itself, and it’s brought to reality by actresses Lea Seydoux and Adele Exarchopoulos. Take a bow, ladies. Grace, played by Brie Larson, works at a foster care center for at-risk teenagers along with her boyfriend Mason (John Gallagher, Jr.). This isn’t the setting of a comedy, that is clear. Yet, director Destin Cretton finds the small thrills and highs of working there through the lens of two newcomers, one a young girl and one a new worker. While this is primarily Grace’s narrative, the two newcomers would likely threaten to overtake the film and steer it wildly off course in lesser hands. But Cretton navigates this with aplomb and the result is a film that is uplifting while navigating through serious matters of abuse and neglect. It’s an exploration that life is most complex when we don’t talk and harbor our desires, fears, and wrongs. With help, with love, with the passionate care of these workers, we can get through some bad points in life. This is a film that will powerfully shift the way you view what it means to be young and floating through life even when it appears all is right from the outside. Or just the opposite. Director Steve McQueen has managed to create a narrative-shifting work that explores the absolute corruptibility of slavery. Everything about this institution made the human being seem like a malleable object. Whether that is beating them to a bloody pulp and mauling the bodies of those that did hard manual labor, or poisoning the souls of those it touched and warping people in various, sometimes subtle ways, slavery simply formed those that it touched in the ways it wanted. 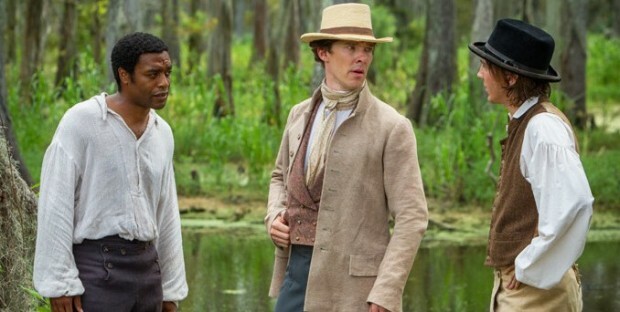 McQueen has assembled a cast that is impressive and necessary to tell the tale of Solomon Northup (Chiwetel Ejiofor), and each one seems to play a vital role in how many different shades of darkness there were during this time. Solomon’s narrative is a unique one, but it’s the steady hand of McQueen that allows the film to become transformative — particularly during a sequence of Solomon in a noose — and required viewing for audiences this year. What does technology afford us? Is it the ability to shut out the outside world and focus on what we want, when we want it? Having your iPod earbuds in while you walked around campus was nearly ubiquitous during my time in college. But seeing teachers having to navigate the students’ use of tech in the classroom was harrowing. Was the laptop open for school work and taking notes, or were they playing games and browsing the net? Oh, and please silence your cell phones and put them away, out of sight. Technology is wonderful, until it’s not, but it’s mostly up to us. Her, richly told by Spike Jonze in his solo screenwriting debut, focuses so much on how technology can warp things that people seem to miss the point. Theodore (Joaquin Phoenix) is a lonely writer in the near future that finds a connection with a hyper-intelligent operating system that names itself Samantha (exquisitely voiced by Scarlett Johansson). As she learns what love means, he is along for the journey that brings him great joy until he seems to hit the same wall he has with his human relationships. Are we ever ready for love? Perhaps we aren’t, but we’re fools and sometimes we can’t help but rush into situations that are perplexing. Yes, technology can distance us, but witness just how connected the people are in Her when they want to be. There’s beauty all around us in our world. Sometimes even a computer can see that better than we can. Her may not break new narrative ground in terms of the future and our relationship with technology, but as a film it is as rich and nuanced as I could hope, leaving room for interpretation and letting us — the humans — make the connection instead of telling us what to do.